/ Are full face snorkels safe for kids? How to choose the best one. ​​​​Thinking of buying your children full face snorkel masks? In this article we explore the best brand full face snorkel mask for children, with an honest approach of whether or not these will suit your children's swimming style. There are some very minor drawbacks to full face snorkel masks that you need to be aware of before you commit to buying one for your children. Click on the link below to take you to your most pressing question, or keep scrolling to read more on how to pick the right full face masks for you and your children. The Good News - Snorkeling is now better than ever! Should you buy children a full face snorkel mask? What's a Dry Top Snorkel - Does water get in? How does sizing work with children's full face snorkel masks? Which is the best Full Face Mask for children? READ THIS before considering a full face Snorkel Mask! Looking for more detailed information on individual full face snorkeling masks? Which is the best Sunscreen for Kids? Full face snorkel masks have made a big impact in the world of snorkeling. Full face masks overcome many of the pitfalls of snorkeling and have been a game-changer, especially for children. Even the best quality full face masks are becoming more affordable as newer versions are released. As new brands continue to enter the market, their prices and quality varies. If your kids love paddling around on or near the surface, then absolutely you should! 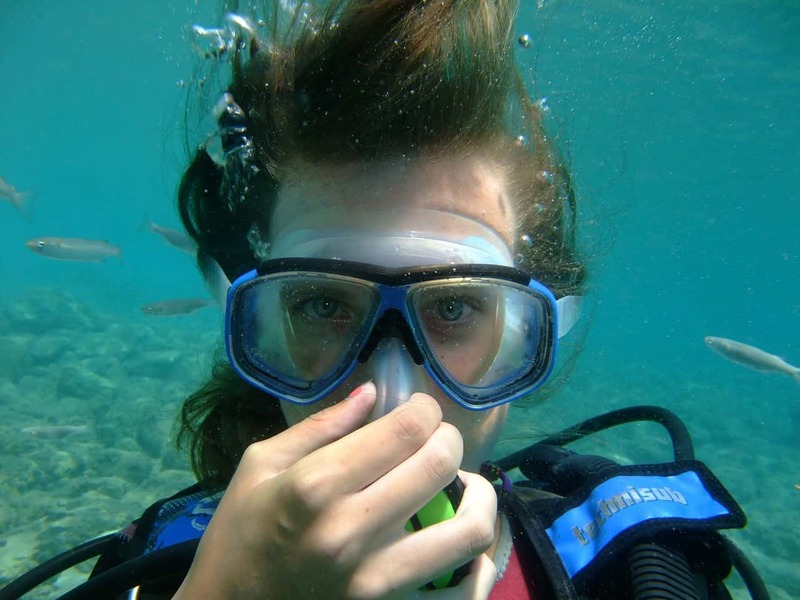 The innovative design of full face masks makes snorkeling a fun and unforgettable experience. These masks are comfortable and easy to use. Once your children have tried snorkeling with a full face snorkel mask, most will never want to go back to the old style snorkel again. The straps are elasticized making these easy to put on and adjust to a snug fit. After the initial adjustment, they'll see how much fun these are. There is no need to stop to empty out water, defog, or re-adjust the straps. There is no sore jaw or teeth, and no gagging on a snorkel mouthpiece that's too big for them. 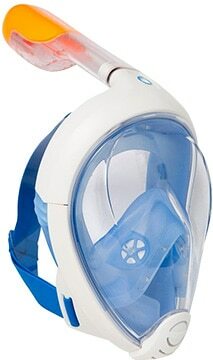 Full face snorkel masks have a separate chamber for breathing, so the viewing section doesn't fog up. If your kids are anything like mine, having a mask that isn't constantly fogging up is going to go a long way to EVERYONE having a more enjoyable time! Children seem to take to these easier than many adults, but are they safe? Generally speaking, full face snorkel masks are no more dangerous for your children than a traditional mask and snorkel. If your children can swim and use a traditional snorkel mouthpiece and mask, then they'll have no problem using a full face mask. 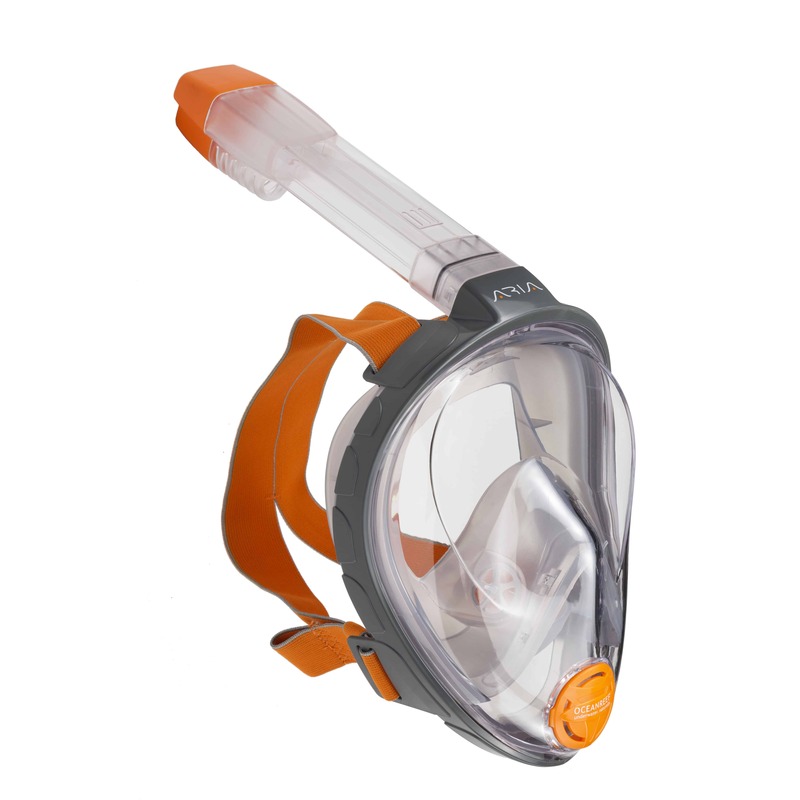 Full face snorkel masks are no different to traditional snorkel masks sets when it comes to safety. Always supervise children when swimming and snorkeling. There are many brands available to buy both online and in stores. The best full face masks are made with quality materials, but innovation and quality comes with a price tag. A lot of the cheap full face masks are direct knock-offs of good quality brands. Many versions are made in China using inferior quality materials. Sadly, some are very poorly made, with one common complaint is that there are leaks in joins where there shouldn't be. It's inevitable that kids grow and understandable that you don't want to spend a fortune on a product they're quickly going to grow out of. When choosing a full face snorkel mask, make sure it's a good brand as there is a difference in comfort for your child as well as the price. Sometimes it pays to spend a little bit more, and have peace of mind. If you buy a decent mask, then it should last long enough to be handed down to younger siblings or cousins after your child grows out of it. 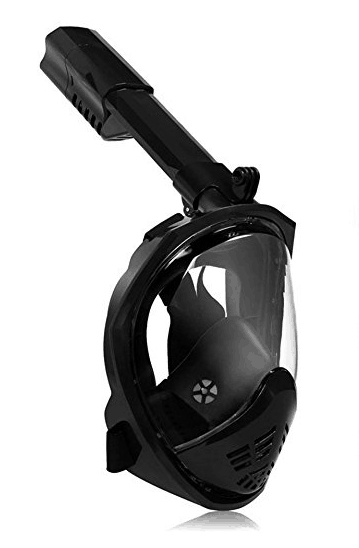 Full face masks have a dry top snorkel system in the tube. There are conventional snorkels with these incorporated into them, but the full face snorkel mask takes this to a whole new level. A Dry Top Snorkel uses a ball float system inside the snorkel. It stops water from entering the snorkel. As you lower your head into the water and the end of the snorkel is submerged, the float rises up and blocks the tube effectively stopping water from getting in. 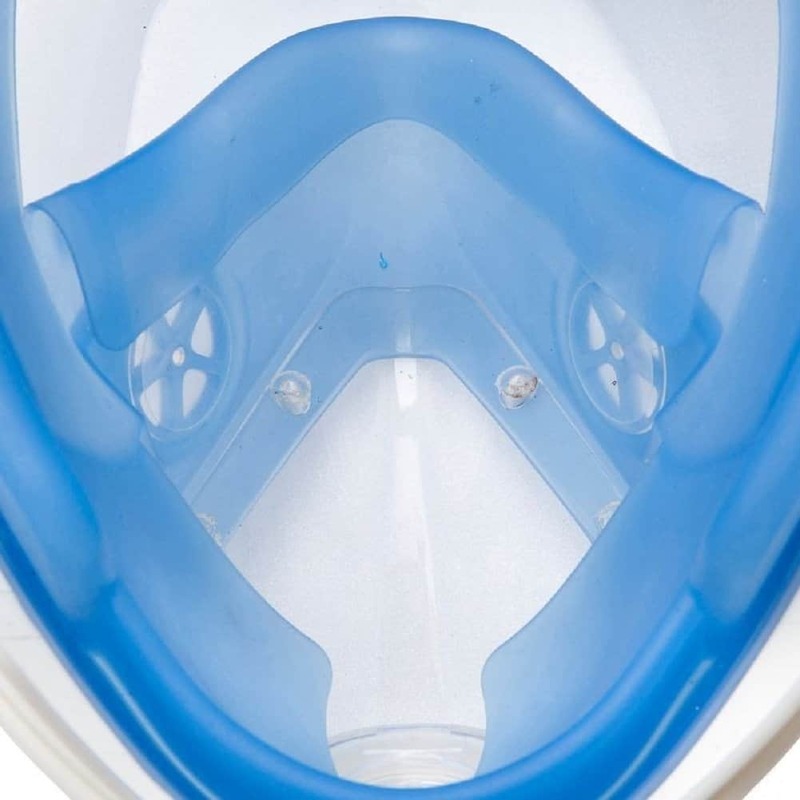 If a small amount of water does enter the snorkel, full face masks are designed to channel this to the chin area of the mask, away from the face. 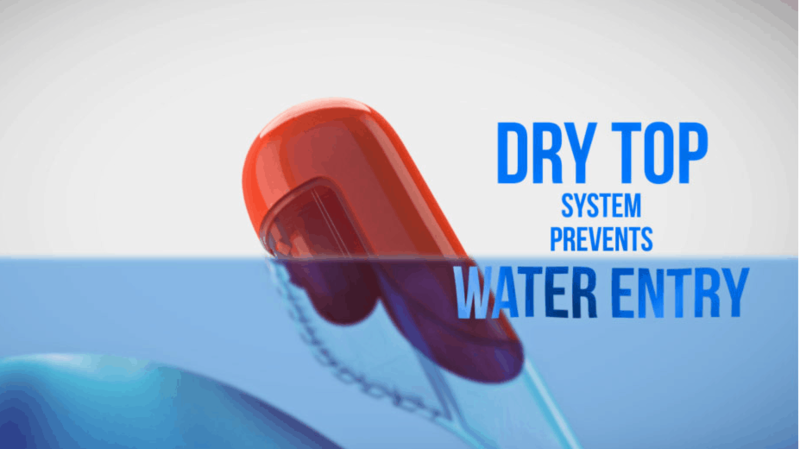 Water then drains out through a valve located on bottom of the the chin as soon as you raise this above water level. Looking into the lower section of the mask. This section covers your nose and mouth. If water does get in, it's channeled away from the face and out thorough a chin valve. After diving below the surface, there's no need to blow water out of the snorkel when you resurface - just breathe normally again. The short video below shows how easy it really is for children to put on, adjust and use a full face snorkel mask. When buying for a teen or large child, always go down a size if you're unsure. Don't buy a mask that's too big thinking it will work now and last them longer. Always buy the correct size for the child. When it comes to sizing, full face snorkel masks can still be used even if they're a little on the small side. I recently used my younger son's XS size mask without it leaking, although I fit an adult S/M size mask. I can't use my older son's M/L sized mask as it's too big for me and leaks immediately. If you want to introduce very small children to the underwater world, you may find that even an XS size may be too big for them. An alternative to a full face or traditional snorkel is a bucket snorkel. These are for very young children who may not yet be good swimmers, or are too small for these masks. When choosing masks for children, make sure you go with brands that have XS or S sizing. Whichever brand you decide on, make sure they have a good returns/exchange policy in case the size isn't quite right. 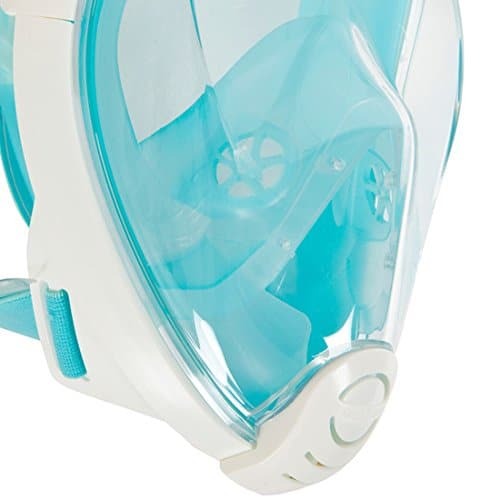 The best full face masks currently available for children are the Usnork Full Face Mask, Tribord EasyBreath, Wildhorn Outfitters SeaView 180 Panoramic, and the Ocean Reef Aria snorkel mask. With each of these full face snorkel masks, you are buying a good product that will give you hours of enjoyment. All come with a full manufacturers warranty and outstanding reviews on Amazon. Ocean Reef make diving equipment as well as snorkel masks. They're a great brand and their products are made with higher quality materials. Ocean Reef also makes full face Scuba diving masks so you know their snorkel mask is going to be exceptional quality. The Ocean Reef Aria now comes in 3 sizes, including one especially for the kids. The Aria also has more options when it comes to accessories. These have an optical accessory available. These are a Support only - it's like buying eye glasses without the glass. You can take these to your optometrists to have lenses fitted to suit your eyes, or you can buy the generic lens to fit. 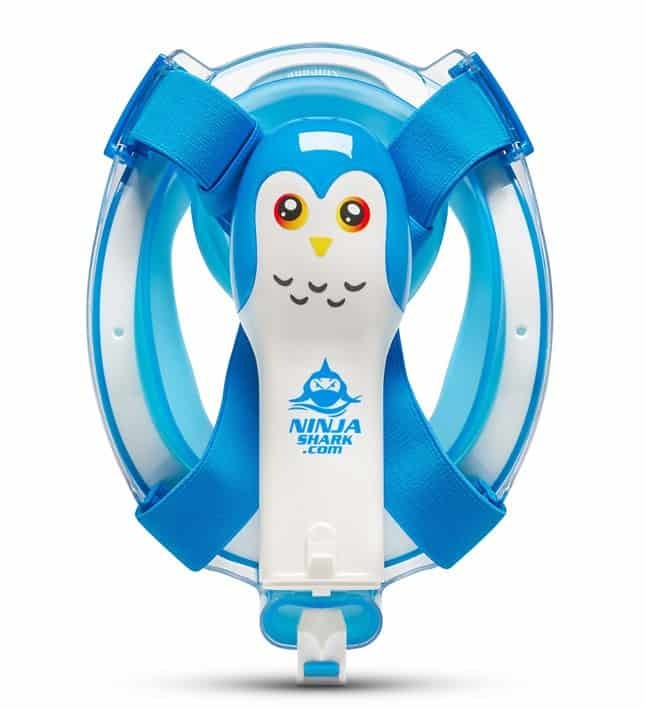 There's a video showing this in more detail on the Ocean Reef Aria product review page. Ocean Reef have been developing a surface communication unit for their snorkel masks which is now available. They've given it the very catchy name of the 'Snorkie Talkie'. These have a communication range of up to 900 feet (or 275 meters), so you can easily chat with anyone on the same frequency. Snorkie-Talkie comes with a rechargeable battery and USB cable charger. The battery has 1,200 stand-by battery life once fully charged, will give around 8 hours of operating time. The transmitter / receiver snaps onto the end of the snorkel tube and is connected to a speaker by a silicone tube, that you place over your ear. Before you run out and buy these, you need to be aware of some of its restrictions. They are waterproof to around 9.8 feet (or 3 meters), and it won't work when the transmitter is submerged. These are for surface communication. Being waterproof to nearly 10 feet is still a very reasonable depth for these masks, so I wouldn't let this stop you if you were considering buying these units. Ocean Reef are at the top end of the pricing market. This is the mask to go for if money is no object. Ninja Shark has recently redesigned their previous mask and released a greatly improved newer version. The Ninja Shark has a big advantages over other masks. It allows you to equalize so you can swim deeper than other masks. They have just released their Buddy mask which is made especially for children under 12 years old. These are super cute and come in either pink and blue. As well as the Kids size, they also have a universal adult size that covers snorkelers over the age of 12 years. This takes all the guess work out of choosing the correct size for everyone. In Australia? Click the Ninja Shark button above to visit their AU website. 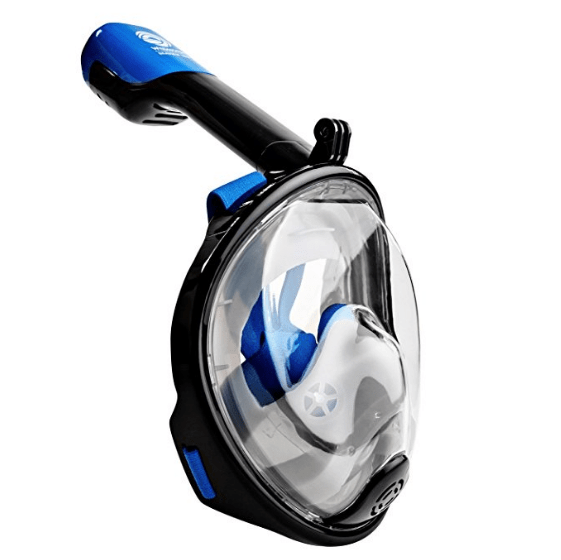 Tribord developed the first full face snorkel mask. 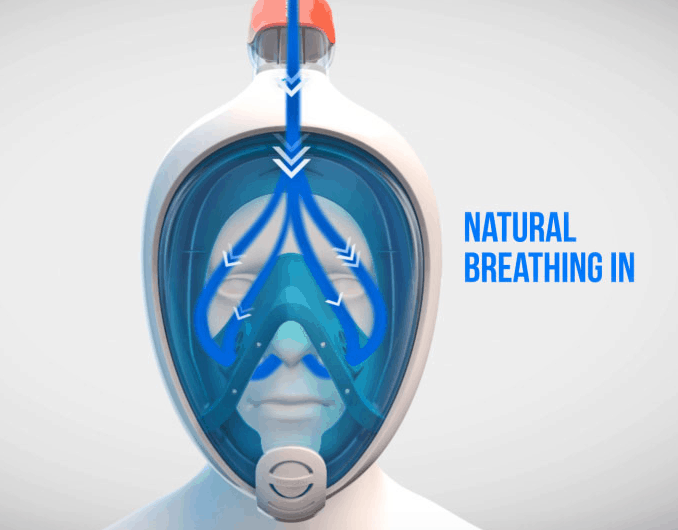 When they released the Tribord EasyBreath full face mask, this became a game-changer for the world of snorkeling. The Tribord EasyBreath full face snorkel mask is very well designed and made with good quality materials. It's not a cheap version of an expensive brand. This is a great mask at a very good price. These continue to come down in price as different versions are released. Tribord has continue to improve on their original design. These come in 4 sizes, making it easy to find the right one for all members of your family. Tribord are undergoing a branding change and are also branded as Subea. They are cutting down on their range of sizes so Tribord will lose a lot of the children's market in 2019, but while these are still available, these are an excellent choice for children. Wildhorn Outfitters have recently released their masks in a children's size. They have also released a large number of new colors but currently the XS size is only available in the one color. The price of their children's size full face snorkel mask is very competitive for such a high quality mask. Children's sizes are currently available for just under $50. 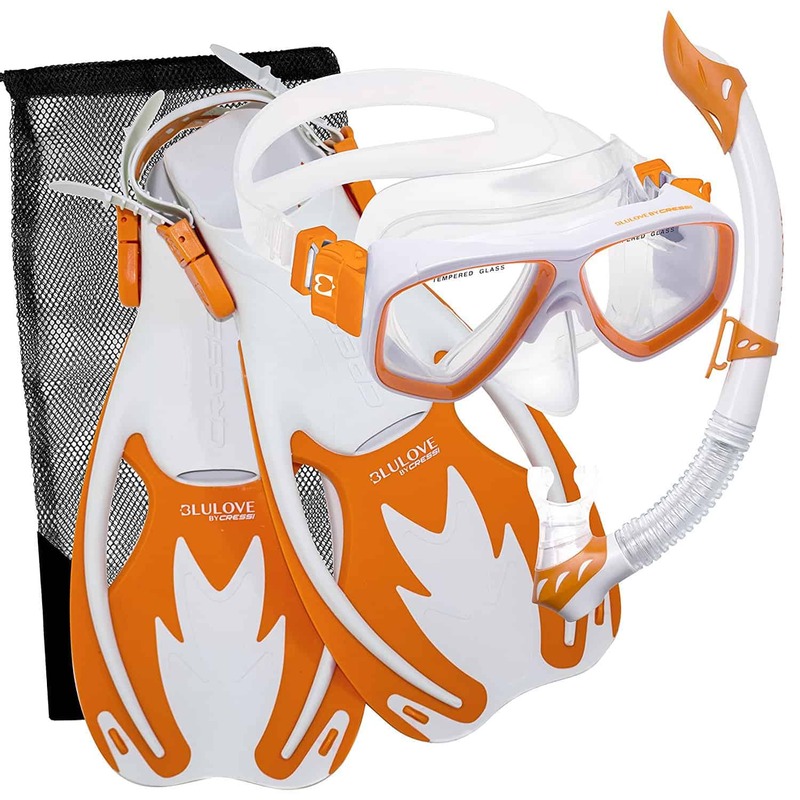 SeaView full face snorkel masks comes in 3 sizes, including an XS for children. No matter how good the brand you pick, there’s no getting around some things with full face snorkel masks. Here are the drawbacks that you should be aware of to avoid disappointment. Full face snorkel masks are designed for snorkeling in relatively calm water. As with a traditional mask and mouthpiece, if you lean your head too far forward, water will enter the snorkel. The float valve system only works when the snorkel is in a vertical position. Water may enter the snorkel when duck diving. These are not designed for swimming laps in a pool. Full face snorkel masks are designed for leisurely snorkeling. They work well when breathing calmly. They are not a good choice for swimmers exercising, and should also be taken off when swimming between snorkeling spots. Most snorkel air pieces are not wide enough to provide a swimmer with enough oxygen when swimming at an exercise pace. These are not designed for Free Diving or spear fishing. 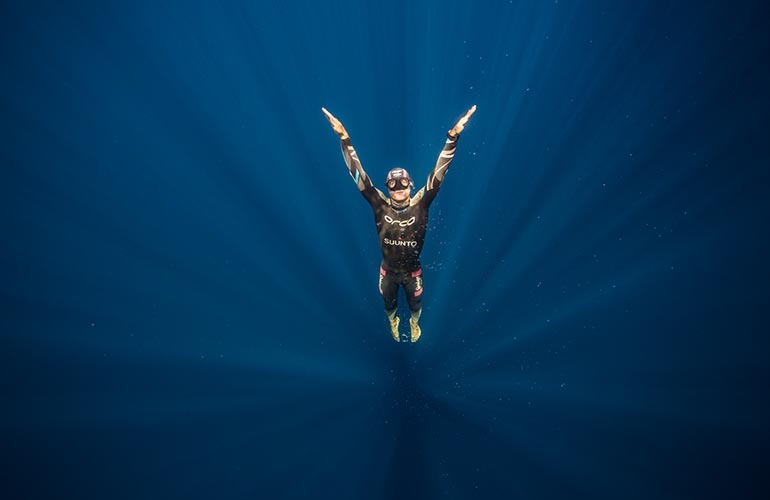 The mask will quickly becomes uncomfortable when diving below around 10 feet (3 meters). Whether it’s a traditional mask or a full face snorkel mask, water will get in if there’s any hair between the skirt of the mask and your face. Long fringes and hair needs to be cleared completely out of the way or they will create tiny spaces that cause water to slowly leak into the mask. Buy the right size for your child's face. Full face snorkels will leak if it's not the correct size. Size charts are available for all brands of snorkel masks so make sure you follow these. Go for masks with a flat viewing section. Full face snorkel masks with curved viewing areas can distort the view and sometimes makes people feel woozy. Go for ones with a transparent or almost clear silicone nose / mouth chamber. Masks with a full block of colored silicone will restrict the wearer's peripheral viewing. Masks with transparent nose sections can be feel more enjoyable to many users as you can see more beneath you in your peripheral vision, and don't feel so closed in. Let's face it, not everyone's budget will stretch to a top quality full face snorkel mask. 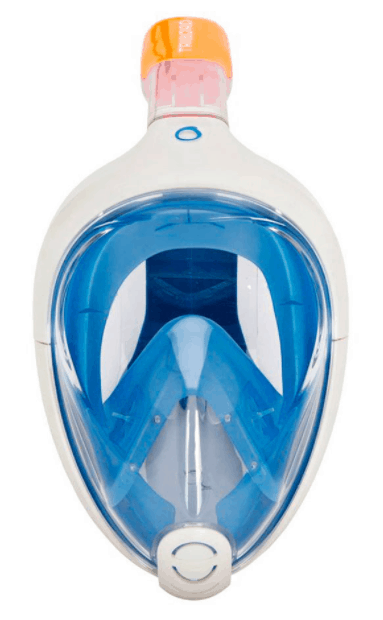 If you're on a budget, you can still enjoy the amazing benefits of the full face snorkel mask. The most important thing is that you get the correct size for your face and buy one with a transparent (or nearly transparent) nose section. The compromise could be that you buy last year's model of a quality brand. It's easy to snap up a bargain if you're happy to go with last years model. Click on the link below if you'd like to read some more in depth information or see some videos of these full face snorkel masks in action. Full face masks are such a big change in snorkeling, but what if you're still not convinced this is the way to go? There are some great (and not so great) snorkeling mask sets available. Regardless of whether you choose a full face mask, or a traditional snorkeling mask, we're here to recommend the best quality gear, so no-one is left disappointed. The mask set we recommend for children is the Cressi brand. Cressi have been making snorkel and scuba gear since the 1940's so we know they're doing something right. 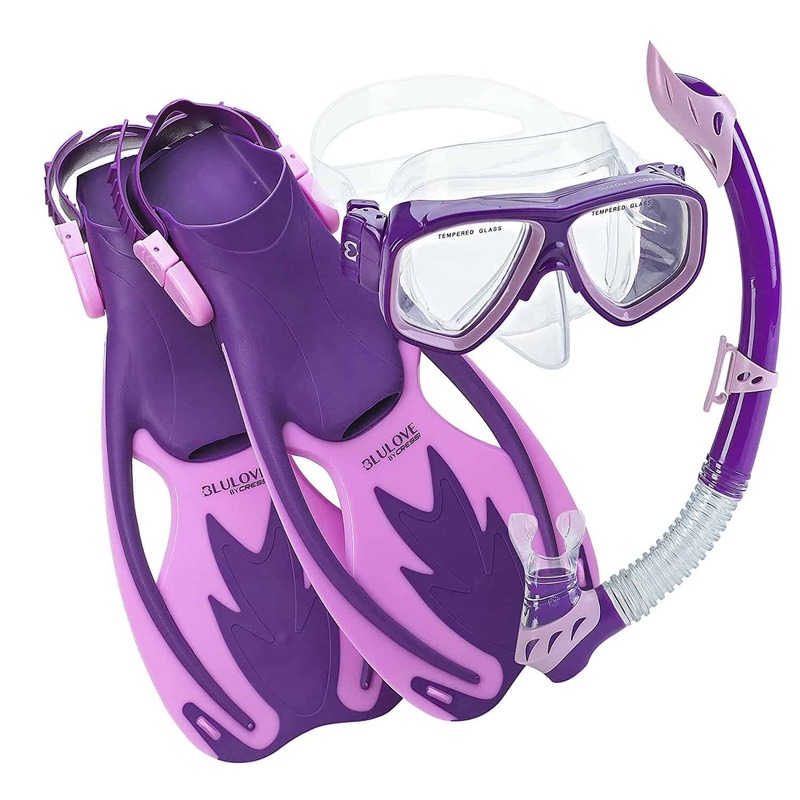 The Cressi Junior Kids Rocks Snorkel Set comes in three colors and two sizes. 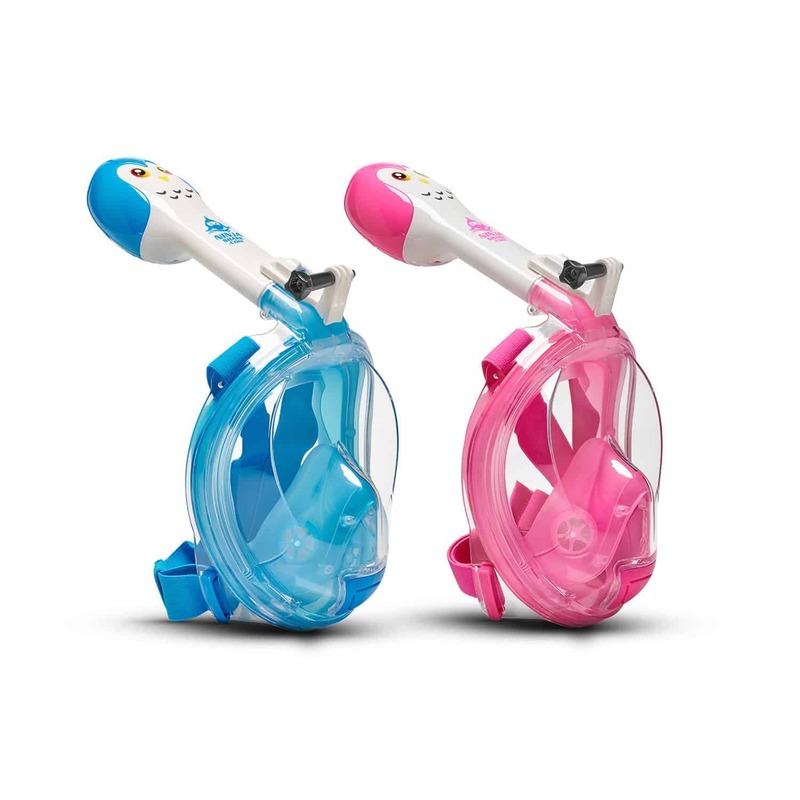 These are designed for children aged from around 6 to around 14. The snorkel set includes a set of fins, a traditional style face mask with a silicone skirt edge that's designed to accommodate children's narrower faces. This set also includes a curved Dry Top snorkel which uses the same principal to stop water getting in as the full face mask snorkels. It has a splash guard on the end with a valve that seals the snorkel as you go underwater. A mesh carry bag is included. This snorkel is designed to go on left hand side of face so it can be attached to the mask strap by a snorkel keeper clip. If you're children have problems with the fins being slightly too big, a set of wetsuit style booties will help. 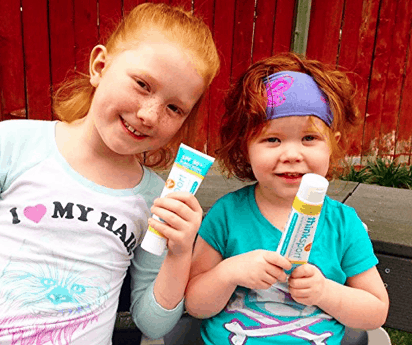 If your family is heading out into the sun, chances are you're going to need sunscreen. 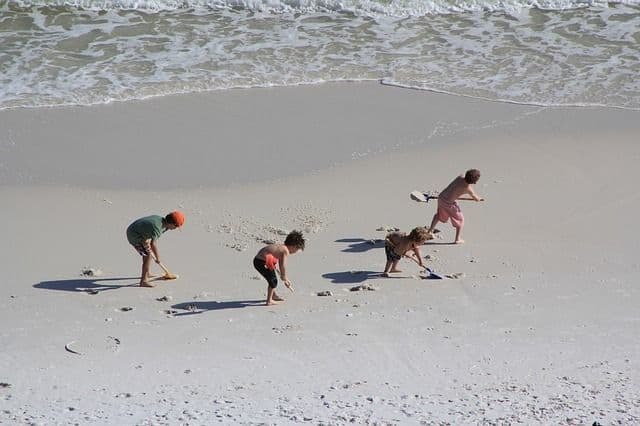 We all know how much kids love to play in the sand or spend lots of time in the water, especially when on holiday. Yes, I know, here I go again sounding like a mother (there's a reason for that). Before making a choice on which sunscreen to buy for your children, there's a couple of things you probably want to be aware of. There are 2 chemicals in many well known brands of sunscreen that you probably want to avoid. These are Oxybenzone and Retinyl Palmitate. You also need to avoid anything that has a SPF factor of 55+ and higher. Anything up to SPF 50 is ok.
Before your eyes glaze over completely, I want to keep this as simple and as helpful as possible to guide you to the best sunscreen currently available for children. If you do a Google search, you'll find plenty of trustworthy websites with in-depth information about these chemicals if you need more information. The one recommended below does not contain either of these chemicals. 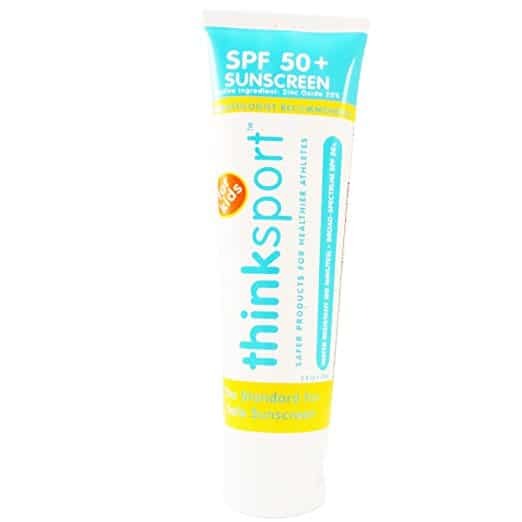 There's some really nice things about the ThinkBaby and ThinkSport Kids Safe Sunscreen products. This is a mineral based non-toxic sunscreen, and it doesn't contain any biologically harmful chemicals, such as the ones mentioned above. This is the first sunscreen to pass Whole Foods Premium Care requirements, and has won more awards than any other sun care product. This has not been tested on animals. Both ThinkBaby and ThinkSport for Kids have the highest SPF rating, water resistance and Broadspectrum coverage under the FDA Guidelines. The active ingredient is Zinc Oxide which provides protection against UVA and UVB ultraviolet radiation. 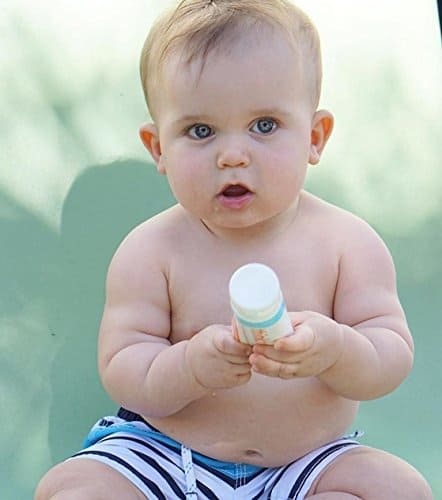 ThinkBaby/ThinkSport LIVESTRONG sunscreen is made in the USA and is safe for children over 6 months of age, adults (including pregnant women), and anyone with sensitive skin. 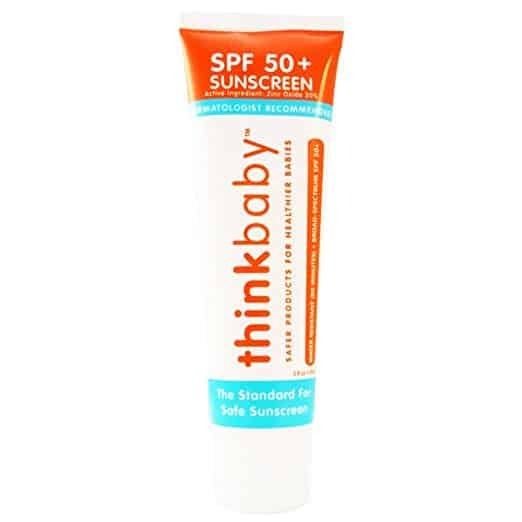 thinkBaby and thinkSport Kids sunsreen is easy to apply and doesn't feel oily. I bought 4 of these full face snorkel masks for our snorkeling cruise last year. To me, it was nice not having the mouthpiece, the breathing tube comes out of the top of the mask and you just breathe normally into the mask so it is good if you want to breathe through mouth or nose. I found the pressure on my face strange, but it was easy to adjust. My kids had no problem with them and since it was their first time snorkeling I feel like it made it easier for them since they could just breathe normally and not through a tube. (They were 17 and 14) I think it would be a good choice for younger children as well. My sister in law tried it and she said she thought it gave better visibility than a regular mask. Thanks Mary, I’m glad to hear you and your family enjoyed the full face masks. Children do seem to take to these very well. You may find that you can hire some when visiting the Maldives. I think it’s a shame that Tribord is cutting out the XS size as I think children really have a lot of fun with these masks, but I understand they’re doing it to keep manufacturing costs down. These were much more expensive to buy when they were first released and have come down a lot in price. Very few brands have XS sizing available, unfortunately. Hi, I have a 5years old kid. Any recommendation for my kid..? And thank for your article lots of value here. Thanks for sharing this great detail article. My children will glad to see these water accessories.